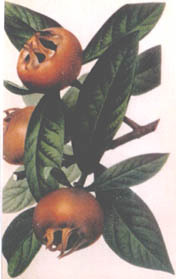 The fruit that we feature is the MEDLAR, which stands out, unique, independent of comparison to any other tree fruit. It is an ancient treasure for the 3rd millennium. Described by the Greek botanist Theophrastrus, over 2000 years ago, it was once widely cultivated in Tudor, England. Parkinson in 1627 spoke "of the pleasant sweetness of the fruit when mellow". But today they are nowhere available in shops or markets and impossible to find except in a few private gardens. This should change. The Medlar is a fascinating fruit. Botanically somewhere between a pear and a hawthorn, it blossoms in solitary fashion in May at the end of the shoots of the same year's growth. The spring flowers are large, white fading in pink as they age. The unique dark green brown fruit looks somewhat like a small crabapple which forms without stem at the end of the shoot and becomes the half of a sphere with the petals arranged around the edge of the flattish top. The decorative fruit is picked after a hard frost. The flesh is then still hard, green and austere and must be kept on a dry cool shelf until the pulp softens and mellows when it turns a light brown. This process is known as "bletting". The pulp has then a distinctive pleasantly acidulous flavor. It makes a beautiful small tree that fruits early, a 3-year-old tree producing a good crop. It has curious branches forming sharp-angled elbows. The leaves are large luxuriantly green and downy and turn beautifully red in the fall. Easy to grow, hardy, not particular as to soil or culture, it can be grown for its eye-catching ornamental value alone. But it has long been regarded as a dessert fruit for connoisseurs. Prof. Saintsbury in his classic book on wines, "Notes on a Cellar", declared that "the one fruit which seems to me to go best with all wine, from hock to sherry and from claret to port, is the Medlar - an admirable and distinguished thing in itself, and a worthy mate for the best of liquors". Francesca Greensack in her fascinating book "Forgotten Fruit" said, "the lingering, slightly sweet, slightly winey flavor makes the Medlar seem like a natural comfit". She also mentioned "roasting them with butter and cloves as a traditional winter dessert" and recommends jelly made from them "as an accompaniment to game". At Southmeadow we found that the pulp of the Medlar, folded into whipped cream and some sugar makes a superb chilled mousse. This "fruit de fantaisie" as the Frenchman Duhamel called it, should be restored to the fruit garden. It is of intriguing interest to the eye and palate alike as it stands unique among the fruits of the world. Some years ago we located the Nottingham variety which Hogg, the great British Pomologist regarded as "the best Medlar in cultivation" and the "more highly flavored"
Whether for its amazing fruit or just its unique decorative tree, we encourage our customers to plant it. It will turn any garden or landscape into a rare fruit reserve. Each harvest year we engage in the pleasant task of testing and tasting the apple varieties from our scionwood orchard and from the fruit garden at Southmeadow. We make a judgment as to which are so superior that we feel they warrant a place in every fruit garden. Because the past year was such a vintage year, we thought our customers would enjoy reviewing with them this premier selection. Dominating this selection were "The Classics" all of which have been around for 100 years or more. They include those colonial varieties ESOPUS SPITZENBERG, President Thomas Jefferson's favorite apple, twelve trees of which he planted at Monticello in 1790 when he returned from serving as our ambassador to France. Even today its firm, crisp, juicy, yellowish flesh with a rich aromatic flavor makes it one of the best to eat out of hand. The skin is brilliant orange red with gray spots, a beautiful sight on the tree; NEWTOWN PIPPIN, then called Albemarble Pippin two rows of which George Washington grew at Mount Vernon. Solid green, sometimes with a reddish blush, the best of keepers. One of the two apples rated best in 800 or 900 varieties described in the classic 1905 work by Beach, "Apples of New York". It still fully merits that rating. Newtown Pippin is one of our favorites here at Southmeadow and will continue to be enjoyed and shared from the time of our forefathers well into the third millennium; COX'S ORANGE PIPPIN, to the British for whom the apple is king, this is the king of apples, its unique complex rich intense aromatic flavor making it as one authority said: "the greatest apple of this age"; ASHMEAD'S KERNEL, raised by an English doctor before 1720, but today in first rank for the fruit garden because as Morton Shand said speaking of its "honeyed nuttiness" "no apple of greater distinction or more perfect balance can ever have been raised anywhere on earth" and CALVILLE BLANC d' HIVER, served at the table of king Louis XIII of France as early as 1627 and one of our all time favorites for dessert and for all culinary uses. We should not be surprised that these head the list. We are reminded of the words of Dr. Potter, once longtime director of England's 3000 worldwide variety collection. He said, "for best flavor and for variety of flavor go to the older apples" and certainly they have stood the test of time. Apple trees don't live forever. For us today to still have a variety discovered centuries ago, means that generation after generation of men and women had to believe it was so good as to be worth being reproduced through the miracle of grafting over and over again throughout the centuries. We wonder how many of our current newer commercial varieties will be around 200 years from now. But this does not mean there are not any newer varieties that belong in this premier list. In our testing this year we nominated two: HOLSTEIN, a German seedling of Cox's Orange introduced in 1950, which produces every year a beautiful crop of large, unblemished fruit of equally exquisite flavor. Wonderful to eat straight from the tree and for culinary purposes as well, a good keeper, scab resistant, ripening late September; and MELROSE, a Jonathan and Red Delicious cross introduced by the Ohio Agricultural Experiment Station in 1944, which we said 30 years ago in our first Illustrated Catalog (and is said today by apple connoisseurs everywhere), is worthy of being included in any all-time list of choice apples. Melrose is a large, rugged, long keeping, red to red striped apple with just the right balance between sugary sweetness and tartness, tops for both eating out of hand and culinary purposes. Then came a group of old American varieties, all revered in the pomological literature of our country and even in European books: MOTHER, which Dr. Potter included (even though an American variety) among his list of five favorites - 5 out of 3000! His other four were ASHMEAD'S KERNEL, COX'S ORANGE PIPPIN, RIBSTON PIPPIN and ST. EDMUND'S PIPPIN; NORTHERN SPY, the great long keeping pie apple found in a New York seedling orchard before 1800; TOMPKINS KING, which we say now as we did in our 1965 catalog "brings back childhood memories of the way a real apple ought to taste"; CANADA RED, a beautiful bright red apple with conspicuous dots of a delicious, agreeable pleasant flavor which Hedrick called "aromatic richly flavored". The flesh is very juicy, crisp, white and fine-grained. Canada Red is a very old New England variety known in 1822 as Nonesuch; WESTFIELD SEEK NO FURTHER, Hedrick said this early colonial fruit apple was "distinguished" by its "full rich flavor and pleasing aroma". Originating during the late 1700's in Westfield, Massachusetts, always a good producer, ripening in October; EARLY JOE, thought to be so superior as to merit a beautiful colored plate in the famous 1876 Dutch book "Nederlandsche Flora en Pomona"; SWAAR, from the earliest Dutch settlers on the Hudson, who gave its name (meaning heavy) because of the intense crisp dense flesh; FALL RUSSET, which tastes like a pear as it mellows and makes a delicious dried tidbit for the cocktail hour; ROXBURY RUSSET, one of the oldest American apples, originating in the Massachusetts town of that name, a late winter apple, it shows an austere perfection and refinement of flavor. Sixty years ago Beach could state: "The Roxbury is the most popular russet apple cultivated in New York." Today, to have this renowned apple with their dessert cheese, the connoisseurs must grow it themselves. Ripens mid October; ZABERGÄU REINETTE, a huge quality apple, the largest of the russets, a spectacular late winter fruit sometimes as large as Spigold, this tasty apple is a sight to behold hanging on a dwarf tree, and two russet sports or mutations of Golden Delicious: HOOPLES ANTIQUE GOLD and COLVIS SPICE, which vary from the original not only in beautiful skin color but in crispier flesh and intensity of flavor. Both are family favorites proudly offered to guests and we well remember the orchardists Mr. Hoople and Mr. Colvis who shared their finds with Southmeadow. There are several varieties of foreign origin: GOLDEN NOBLE (English), this golden apple of skin and flesh was Bunyard's choice for the perfect pie apple "fulfilling all the conditions" and "in every way delectable"; SUMMER RAMBO (French), Rambour d'Été, a very old apple originating in the 16th century and known in America from the earliest days of apple culture. Attractive in its large size and brightly striped skin, its yellowish green flesh is breaking, crisp, agreeably acidious, aromatic and exceptionally juicy. A fine eating apple, ripens in August; KANDIL SINAP (Turkish), strikingly beautiful, tall narrow as a spire with porcelain like creamy yellow and red skin; MUTSU or Crispin (Japan), one of the best of the large Japanese dessert apples with a spicy aftertaste and CORNISH GILLIFLOWER (Cornish, Eng. ), not much to look at but so delicious a poem has been dedicated to it. We like to mention our amazing red-fleshed apples, the astounding HIDDEN ROSE, brought to our attention at an All About Fruit Show in Portland, Oregon. It has not only startling beautiful skin and flesh, but is of premium quality; and SURPRISE, parent of Pink Pearl, first noted in the 1813 "Catalog of Fruits", a smaller fruit that is incredibly packed with juicy and sprightly flavored pink flesh tinged with red. And finally three incomparable sweetmeats, the kind one can put in the pocket on the way to work and munch anytime during the day: KERRY PIPPIN, which Joan Morgan in her definitive work "Book of Apples" characterizes as the "densely fruity taste, its sweet firm flesh"; PITMASTON PINEAPPLE, Morgan says this nugget of gold is "intensely flavored, sweet yet sharp, rich"; and LADY APPLE (another of very ancient origin), crunchy, flavored with distinct segments of red and green coloration. French ladies at the time of Louis XIII actually carried these in their pockets "by reason they yield no unpleasant scent". The 1999 season, as if to celebrate the end of the century, produced the finest vintage of apples we at Southmeadow have ever known. The extraordinary warm late fall weather, frost-free past the middle of November, permitted the late apples to ripen fully. As a result our cider blend was the best we ever had, with a depth of flavor showing nectar-like sweetness combined with strong character. We took over 17 bushels to the cider mill of a large variety mix, which varies from year to year: 3 bushels each of McINTOSH (floral aroma), EMPIRE (good sweet juice) and MELROSE (rich flavor); 1 bushel each of NEWTOWN PIPPIN (rich), FALL RUSSET (pear like), ASHMEAD'S KERNEL (powerful high flavor), HYDE KING (tart), SPIGOLD (sweet tart), ROXBURY RUSSET (austere) and 3 bushels of miscellaneous (CALVILLE BLANC, RIBSTON PIPPIN, SEKAI ICHI, JONAGOLD, SINTA, ADAMS PEARMAIN, RUSSET KING, GOLDEN RUSSET, LAMB ABBEY PEARMAIN). We ended up with 128 half gallon jugs of cider. We need to mention here some of the classical English "cyder" apples for fresh and hard cider as well, KINGSTON BLACK and FOXWHELP with their correct balance of sugar, acid and tannin to make a vintage cider, not a blend. On rare occasions one of the great old American apples mentioned in the early literature is rediscovered. Such is the case with CELESTIA. CELESTIA was first mentioned by John Warder in his classic work "American Pomology - Apples 1887" containing 1500 names of apples. He called CELESTIA a fruit with very profusely, aromatic and spicy flavor. It is interesting that although Warder gave a "best" rating to several varieties such as Canada Red, Esopus Spitzenberg, Newtown Pippin and Early Joe, CELESTIA is the only one he rated "very best". For this reason amateur fruit gardeners have always hoped CELESTIA could be found. We are delighted to be able to make it available. Andrew Jackson Downing mentioned CELESTIA in 1869 describing its flesh as "crisp, tender, juicy, very pleasant, rich, mild, subacid". It was also in the great collection of the New York State Agricultural Experiment Station assembled at the end of the 19th century. Then it disappeared from cultivation until the late Conrad Gemmer of Susquehanna, Pa, found it about a decade ago in an old New Jersey orchard. At the time of his death Gemmer had a collection of 500 varieties, mostly American. He was a lifelong fruit explorer (Perry Russet, Doctor, Golden Pippin were among his findings and are all in our list). He grafted CELESTIA and fruited it for several years until he was satisfied of its authenticity. Gemmer's judgement in this area is convincing. At Southmeadow we also fruited it for several years and have been amazed at its high quality. CELESTIA has a firm pale green skin sometimes with a pink or brownish blush, often becoming yellowish in maturity and speckled broadly with very fine dots. It is exceedingly juicy with a luscious, delicious quality that makes it even today one of the most enjoyable apples in our list to eat out of hand.